Professional Grade ESD Audit Kit. Perfect for testing to the newest esd resistance and field voltage standards. Test flooring, matting, wrist straps, smocks, personal charge generation, voltage decay, ion balance and more. Made in the U.S.A. Guaranteed best Pricing on the Web! Static Solutions RT-2000 S20.20 ESD Audit Kit. 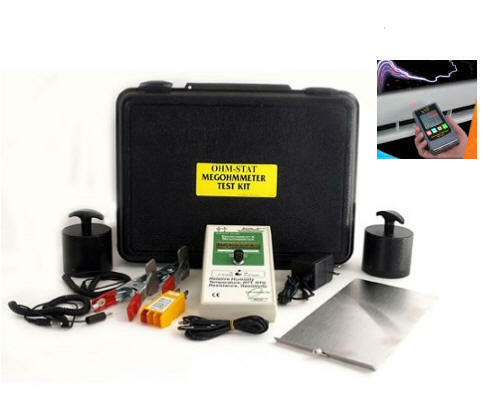 Includes RT-1000 and FM-1126 field meter and ALL the accessories as shown! Now just $1,551 each! The RT-2000 by Static Solutions Inc is perfect for testing electrical resistivity and electrostatic field voltage output to the new ANSI ESD S20.20-2014 AND TR53 Standards. Reliable and accurately test esd flooring, esd floor finish, esd chairs, carts, esd smocks, ionizers, work surfaces, wrist straps, the resistance between technicians / heel straps / esd flooring and MORE! The RT-20000 professional audit kit includes many standard accessories and with readily available optional accessories this package can grow as Industry standards (or your needs) change. The RT-2000 is designed to last a lifetime. It's NIST certified, lightweight, versatile, and robust. The RT-1000 resistivity megger is fully portable and measures resistivity and temperature / humidity (a prerequisite for reporting and saving the cost of purchasing an independent humidity / temp meter). Fully Ranging (from < 1.0E03 to 1.0E13) and 10 Volt or 100 V output capabilities. The RT-1000 accepts a multitude of external test electrodes for accuracy. Parallel bar electrodes are provided on the back of the RT-1000 spot checking matting etc. The FM-1126: Use this device to locate the perfect placement for an esd ionizer. Test the accumulated static charge on ANY insulative item including plastic, conveyer belts and even the technician's clothing! This easy to use tool is invaluable for ALL ESD programs. The FM-1126 is compliant with ANSI ESD S20.20 and many other popular standards. The device includes an ion balance plate, grounding cable, soft shell case and NIST approved calibration documents. Made in the USA! See this Static Field Meter in Action and learn how an ESD smock shields sensitive electronics in this 2 minute video!